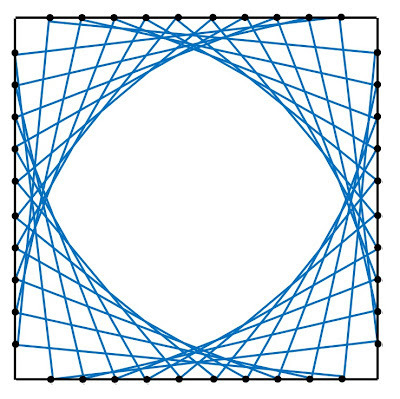 Draw two base lines and mark the same number of points at equal distances along each line. Join the outermost point on one base line to the innermost point on the other base line. Work your way inwards on one base line and outwards on the other base line joining corresponding points. Experiment with different angles between the base lines, also using several pairs of base lines in the same diagram and using different colours. 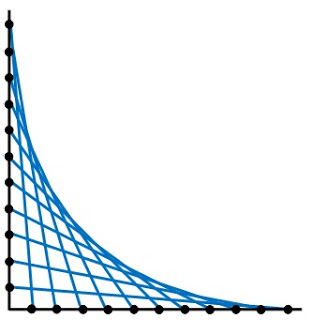 The curves that you see are called ENVELOPES, and the straight lines are tangents to the curves.